This is not a rant about students relying on things like Google and Wikipedia for their schoolwork. It's not that at all. It is instead a rumination about the tendency of some students—at least one in particular—to rely on an information-at-your-fingertips approach to education. The student I have in mind appears to have lost—to a remarkable degree—the trait of self-reliance. Let's call this student “Shawn.” He took my algebra class. He took it twice, having flunked it the first time. In both semesters I was treated to Shawn's pop-up arm, which waved for my attention at the least provocation. As a highly interactive instructor, I welcome student questions and want them to feel that their queries are welcome. Shawn, however, was trying my patience (along with that of his classmates). It took me a while to figure out what was going on. Ever in the moment, Shawn had abandoned thinking. If something—anything—gave him pause, his arm shot up. He wanted immediate clarification from the instructor in preference to actually thinking about it himself. Somewhere along the line he had discovered that the path of least resistance involved asking the professor. Back in the old days before the World Wide Web and Google, I sometimes fussed for hours (or even days), wracking my brain trying to recover some odd bit of information. I'd pull books off the shelf and page through them. Did I read it in this one? Should I dig out the encyclopedia? Did a friend mention it to me in conversation? Should I try calling him? (Which one?) As you may have heard, we call these the “good old days.” I confess, however, that the Internet and Google have become two of my most cherished friends. Facts and factoids are at my fingertips and I discover or rediscover things with alacrity and pleasure. The starkest example of Shawn's abandonment of thinking arose during a lesson on nonlinear systems of equations. I had created an elementary introductory problem involving a parabola and a line, writing their equations on the board and telling the students we were going to discover the points where their graphs crossed each other. The computations were straightforward (amazing, isn't it, how simple the answers are for Example 1?). Then I told the students we were going to examine the plausibility of our solutions by graphing the two curves and considering their appearance. I plotted two points (the axis intercepts!) that satisfied the linear equation and sketched the line. Shawn was keeping his peace and presumably keeping pace. The quadratic equation was a little more challenging to graph, but it was still pretty elementary, so I created a short table of values to find some points that would help us sketch the parabola. In rapid succession, I plugged in x = 0, x = 1, and x = 2. Mind you, we had done the parabola to death in the previous chapter. We had graphed vertical parabolas and horizontal parabolas. We had found their axis intercepts with the quadratic formula (if necessary). Several old quizzes and the most recent exam had featured the parabola most prominently. All of the students, including Shawn, had had multiple exposures to the mundane task of plotting a parabola. 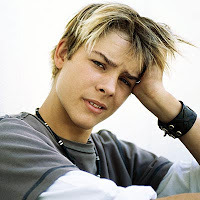 He had had even more examples of plugging in conveniently chosen numbers to evaluate algebra expressions for graphing. Shawn's question was extraordinarily lame. “Right,” I said, hoping that he was indeed right in what he was thinking. It was not easy, but “think about it” became a standard response to many of Shawn's too-quick questions. 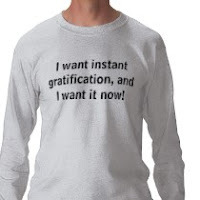 By degrees, he eventually became more self-reliant instead of instantaneously asking the professor. He never learned to postpone gratification to quite the degree I would have liked, but he got a little better. He stopped asking questions without thinking and I stopped answering so automatically. And Shawn's classmates got more rest for their eye-rolling muscles. I have a long list of summer events in California's Portuguese-American community. It looks like I'll be doing a modicum of traveling this summer to promote my book at some of them. Since the small university press that is publishing the novel is without a generous travel budget or promotional expense account, this is going to be a shoestring operation. Every bit of free publicity is going to be valuable and social media will play its part. Last year I started to try to drum up endorsements of the type that might play well as cover blurbs or as quotes in promotional materials. While my favorite quote is my sister's prediction that I'm going to get into “a lot of trouble” (but it's fiction—honest! ), I also managed to get positive comments from a few real-life professional authors. Just enough to give my work a smidgen of credibility. Of course, not everyone who I approached was interested in plowing through a 350-page manuscript from an unknown author. (Imagine that!) I did, of course, offer more modest samplers of selected pages, reducing the time commitment substantially. Clever writers, however, figured out that the best way to reduce the time commitment was to politely (or brusquely) decline the privilege entirely. A couple of my friends were classmates with Joan Didion at UC Berkeley, working with her on student publications at the university. 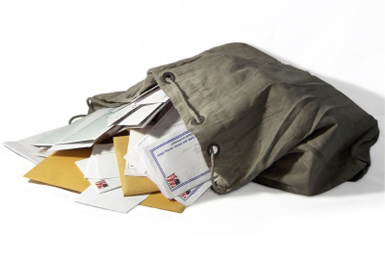 “Go on, write to her!” they said. “What could you lose?” Nothing, certainly. Which is also what I gained. The inquiry via Didion's publisher was absorbed into a black hole of silence. I got a more substantial reaction from Joyce Carol Oates: a terse note from her assistant explaining that Prof. Oates reads only the papers of the students in her writing class and if only I had inquired before sending a packet of pages, I could have saved myself the trouble. Heck. I knew that! I sent the pages in the long-shot hope that they would be tempted to peek at them (and discover a masterpiece!) before consigning them to the recycle bin. The professor's gatekeeper, however, discharged her responsibilities meticulously. That is, of course, why she has that job. In October, as I recounted previously, I boldly bothered Jonathan Franzen during his speaking tour of northern California. When he admitted to reading “just about anything,” I naturally thanked him and promptly shipped off a few dozen pages in care of his publisher. As the weeks went by, it seemed that I had run into another Didionesque black hole, but this week I discovered otherwise. 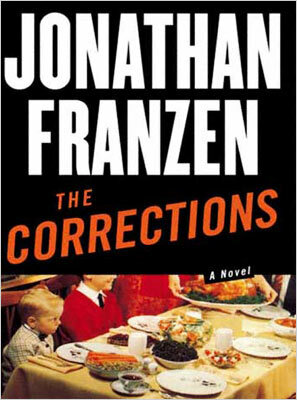 It simply takes Franzen a lot of time—unsurprisingly—to plow through all of his fan mail. He did, however, eventually run into my packet, opened it up, found the stamped, self-addressed postcard that accompanied the sample manuscript pages, and decided it was worth taking a couple of minutes to scrawl me a note and drop it in the mail. He said my novel was “a worthy and entertaining project”! Huzzah! Another useful book blurb! From the bestselling author who garnered the National Book Award for The Corrections! [Your novel] seems like a worthy and entertaining project, but I'm afraid it's too far from the mode of fiction I produce & support for me to be able to help you. I appreciate your thinking of me, though. If only I had a conscienceless public relations person (is that redundant? ), we could make hay of this. But no. Speaking of hay, though, reminds me. Jane Smiley isn't returning my messages! Solved: The Barsoomian spaceship mystery! 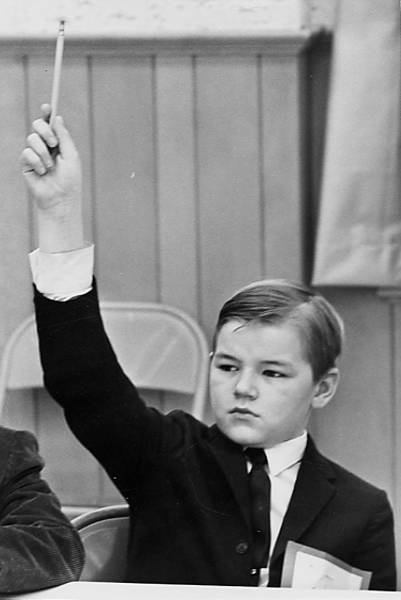 It took nearly fifty years, but at last I have the answer to a niggling question that has been stuck in the back of my mind since grade school. 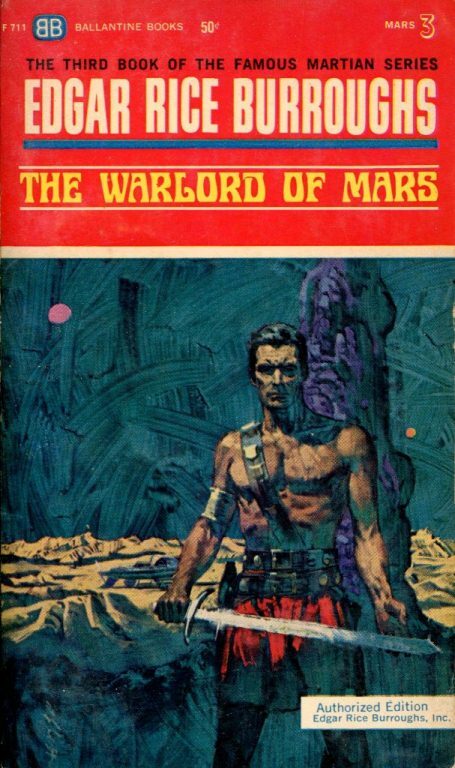 The question arose when I acquired the Ballantine paperback editions of the Edgar Rice Burroughs novels about Mars—or “Barsoom,” as Burroughs rendered it. The cover art was by Bob Abbett, whose work was generally evocative of the adventures contained in the books' pages. One cover, however, was just plain wrong. And it was wrong in a way that made no sense at all. I could not figure out how Abbett had messed up so significantly, and that puzzle stayed with me—unresolved until this year. 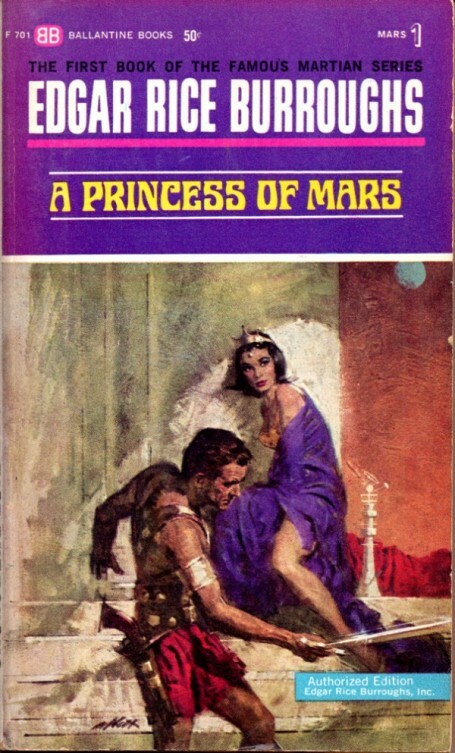 On the cover of the first Mars book, A Princess of Mars, Carter is plying his sword in defense of the incomparable Dejah Thoris (who apparently trademarked “incomparable” as her personal adjective). On the cover of the second book, The Gods of Mars, there's John Carter floating in space next to a spaceship! Something is terribly, terribly wrong. Burroughs had no spaceships in his Barsoom books. John Carter made the transition between Earth and Mars via a strange kind of teleportation, which Burroughs did not deign to explain. No spaceships. But Abbett painted a very recognizable rocketship, fins and all, for Mars book #2. Where the heck did that come from? I now know it came from 1918. 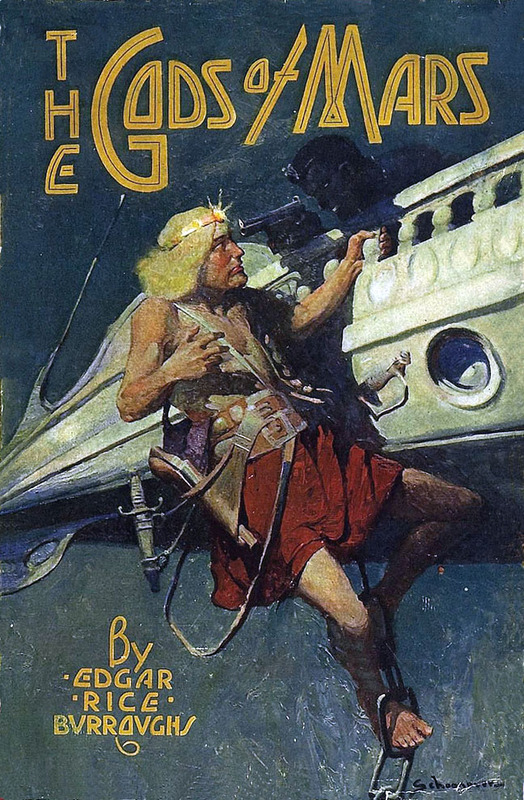 It came from a simple misreading of Frank Schoonover's cover art for the book's original publication. Abbett mistook Schoonover's Barsoomian flier for a spacecraft. Ballantine's cover artist took too casual a look at his predecessor's illustration. Actually, I'm not surprised that Abbett wasn't too impressed by the original cover art. It's rather disappointing. Schoonover's art for The Gods of Mars is extremely faithful to an incident bridging the end of Chapter 6 and the beginning of Chapter 7. That's the main point in its favor. John Carter is clinging to the anchor chain of a flying war vessel manned by the First Born of Barsoom, a proud and handsome race of black Martians who fancy themselves the original intelligent life on the planet (with all other races being their debauched and devolved descendants). I commenced to climb slowly up the anchor chain toward the deck above me. 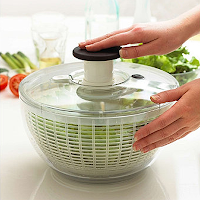 One hand had just reached for the vessel's rail and found it when a fierce black face was thrust over the side and eyes filled with triumphant hate looked into mine. Simultaneously my free hand shot out for the black throat, just within reach, and the ebony finger tightened on the trigger. The pirate's hissing, “Die, cursed thern,” was half choked in his windpipe by my clutching fingers. The First Born mistakes Carter for one of Barsoom's therns—despised fair-skinned rivals of the First Born—because Carter is still wearing the blond wig he used in his escape from the clutches of the therns. 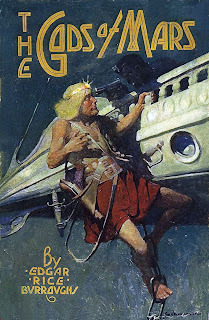 Schoonover paints a rather chunky looking (and practically middle-aged) Carter clinging to the anchor chain, comical blond wig on his head, and a coal-black antagonist getting the drop on him. Abbett dispensed with the wig, painted instead his more robust version of John Carter, and replaced the flier with a rocket ship in orbit about Mars. Poor John Carter, of course, must be holding his breath as he floats weightless next to the spaceship, high above Mars and its thin atmosphere. His red kilt seems hardly a proper substitute for a pressure suit. A hatch atop the ship is ajar, but no First Born has yet emerged to shove a gun in Carter's face. Never mind. Abbett simply made a whopper of a mistake. 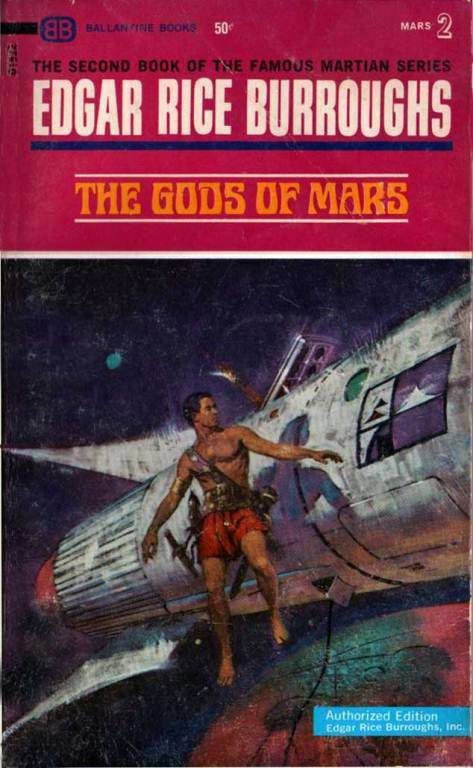 The cover for The Gods of Mars is the one egregious error in the Ballantine edition of the Mars books. 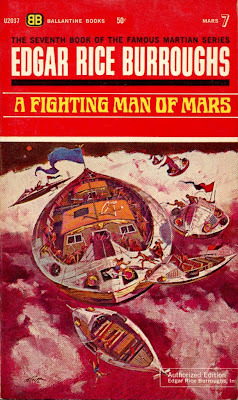 One could even say that Abbett redeemed himself when he rendered the cover of Mars book #7, A Fighting Man of Mars, which shows some properly air-bound flying vessels much more in keeping with Barsoomian fliers. That's more like it! I can rest easy now, with one less nagging mystery gathering dust in my mental archives. The latest issue of Acts & Facts from the Institute for Creation Research offers its usual collection of antievolution essays and articles. A one-page “research” piece (that's how the page header describes it) by Jeffrey Tomkins offers yet another in a long series of ICR pokes at natural selection, a concept that ICR really seems to think they have on the ropes. Once again, evolution is on the brink of utter demolition. 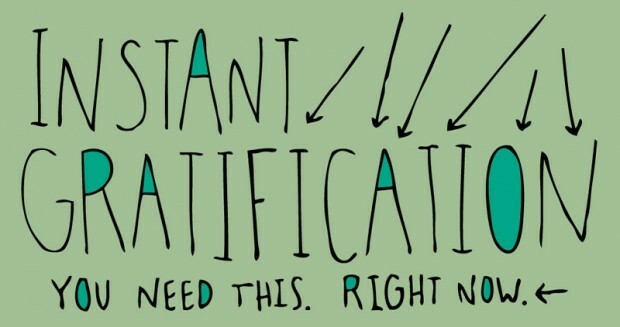 Surely it cannot stand much longer! It's a good thing that creationists are about as patient in anticipating the demise of evolution as they are in awaiting the return of Jesus Christ. 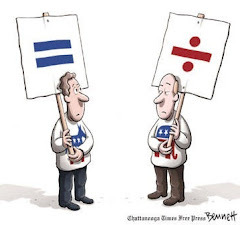 I believe that the one is just as imminent as the other—and I'm sure they agree with me in that statement (if not in my interpretation of it). Environmental stresses and stimuli cannot exercise the creative causation of highly complex pre-coded genetic information that underlies irreducibly complex systems of adaptation. Organismal interaction with the environment involves highly complex and dynamic physiological and genetic responses to a wide range of physical and chemical sensory cues. These environmental cues are perceived by complex systems of cell sensor networks that interact with an organism’s highly engineered genetic system. While adaptation systems are complex and flexible, they are not evolvable on a grand neo-Darwinian scale. They are pre-engineered, pre-programmed, and irreducibly complex in the strictest sense of the term, and they unequivocally imply the infinite intelligence of our Creator God. Well, that was clear, wasn't it? It takes begging the question to new heights of redundant prose. highly complex: the warning shot across the bow! pre-coded genetic information: “pre-coded” implies a coder! irreducibly complex systems: it's Behe time! highly complex: What I tell you three times is true! complex systems: so four times is a total clincher! highly engineered genetic system: the coder has transmogrified into an engineer now. pre-engineered, pre-programmed, and irreducibly complex: the engineer, coder, and Behe in three-part harmony. unequivocally imply: no room for doubt! Are you as persuaded by the author's argument as I am? Yes, that's what I thought. I'm still disappointed when it occurs, but I'm no longer surprised. 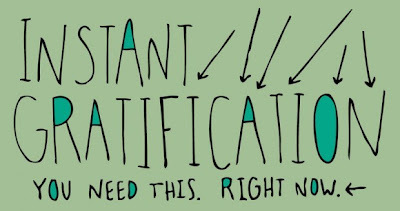 Sometimes, such as when I give an exam on the last day before spring break, I send out a grade update via e-mail so that my students don't have to wait till school resumes to find out their status in the class. My report, which pops up in student e-mail, presents the latest grade distribution in descending order. The closer to the top you find your secret student ID number, the better off you are. Let us consider this. What does the student have in hand? The student has his average exam score: the grades on Exams 1 through 5 all added together and divided by 5. The student has his old exams, numbers 1 through 4. Didn’t you realize you could have computed it yourself? You have your average exam score from the grade distribution I sent out. Multiply your average exam score by 5 and then subtract your scores from Exams 1 through 4. What’s left is your Exam 5 score. I should of know but thanks I'll make sure I put that in my notes. I'm thinking of forwarding that to his English teacher. 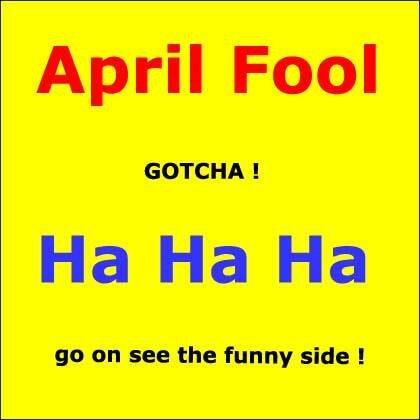 I have no use for April Fool jokes. They are, as a rule, nasty little things. Most of them are—mercifully—painfully obvious and stupid. They do rather little harm. There is, however, a particular type of April Fool joke that I find especially noisome. Jokes of this type are crafted, perhaps unthinkingly, to sound completely true, without even a hint to give the hearer a sporting chance of penetrating the ruse. These are just callous excuses to slap an unwarranted label of fool on someone. There is scarcely a better way to get me to put you on my list of persona non grata. Now how would you feel after expressing alarm or concern, only to have someone grin like an idiot and then yell “April Fool!” at you? Yes, I want to slug people like that (but I don't—usually). I actually experienced two of the above “jokes” and my response to “April Fool!” was an understated “Jerk.” In both cases I froze out the inane prankster for an extended period of time. One was a cousin. It was a small loss. A form of humor based entirely on telling lies and then insulting the people who believe them. What's not to love?